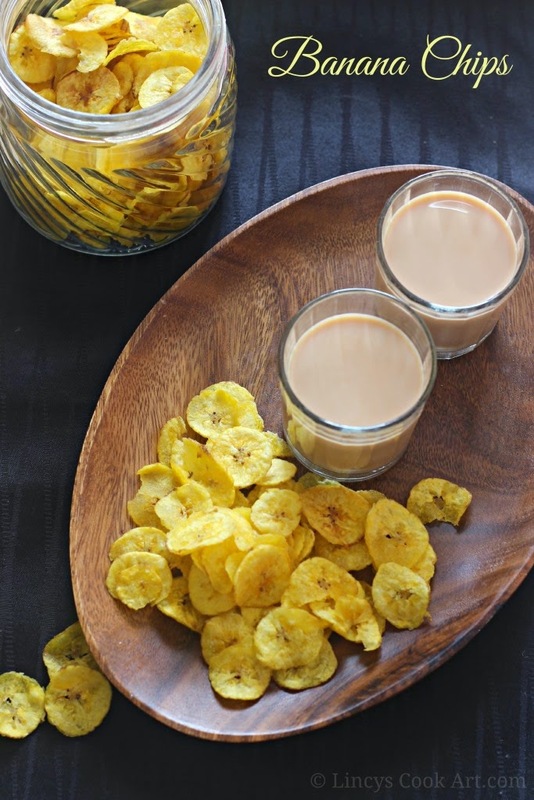 Banana Chips is a popular snack of Kerala. This has been served at Onam Sadya and also as an evening snack with tea. In my native place nendran bananas are cultivated a lot and the first thing you get served whenever you visit a friend or relative is the banana chips. Where ever we travel we bring some kilograms of chips to our friends or relative. When i was doing my studies i used to carry two three kilograms of chips with me. Still i bring whenever i travel from my native to here. Crunchy snack liked by all age groups. Select raw nendran banana which are well mature the peel stats to get light yellow shade. If you peel them it will be mild pink colour. Give a shallow cut using a knife from top to bottom on the peel and remove the peel with knife or hand. Well matured banana you can peel easily. In a bowl add turmeric and water and mix well. Keep the peeled bananas immersed in that turmeric water till you make ready other things to chop and fry for about 10 minutes. Drain the bananas from water and pat dry to remove excess water. Heat oil in a pan over medium heat once it becomes hot reduce the flame and start frying the chips. Using a carrot grater's long blade attachment slice the banana by holding the blade in left and run the banana held on right hand. You can grate them directly on top of oil and fry them like how they do in shops. I am slicing separately because oil may splash while slicing on top of oil. I slice them separately and keep them in oil almost one by one. Because if you keep them at a time these chips stick to each other and some clumps wont become crispy. Fry the chips by constant stirring to fry the whole batch evenly. Mix a teaspoon of salt in 3 tablespoons of water. When the chips becomes half fried sprinkle little salt water over the oil. Fry them till it becomes crispy and light. You can hear the fried chips crispy sound while frying. Remove them fry oil and transfer into newspaper or paper towel to remove excess oil. Store the crunchy chips in airtight containers. perfectly made chips, just love them..
Crispy banana chips, nicely made. Looks perfect like store bought....... Love to have it with hot chai! !